As the population of the United States grows older and more diverse, the benefits provided by Social Security become increasingly consequential. 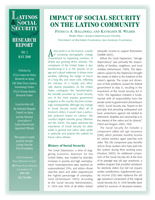 Although any change to Social Security would affect all of America’s elders, it would have a particularly profound impact on Latinos because, as a group, they tend to have a high life expectancy rate as well as low lifetime earnings. Para leer en español, por favor vea el PDF.